Peter Pan is a tale of never-ending childhood. The main hero’s greatest wish is to remain a child forever, as he is convinced that growing up robs people off their imagination and makes them boring. Peter Pan is also one of the most known and famous fairy tales that revolves around the eternal theme of growing up, discovering of new sensations and accepting responsibilities. It is, at the same time, rounded up by a great deal of magic and symbolism. The young hero doesn't want to grow old, he doesn't even want to grow up. Instead he wants to fly, fight with Captain Hook and explore the Neverland. This clever and lively boy has been conquering children's imaginations and hearts all over the world for more than hundred years, since his character has been revived in many films, musicals, plays and books. The story begins when the twelve years old Wendy and her brothers - the eight years old John and the five years old Michael -, have a quarrel with their parents and decide to fly away to Neverland - the island of pirates, Indians, fairies and mermaids. However Wendy is shot down by Peter’s gang of the Lost Boys just before landing. They were ordered so by Peter’s jealous fairy Tinker Bell. Soon after that Michael and John disappear. Missed as well are the Indian treasure trove and the six years old Indian chieftess Tiger Lilly. Are Captain Hook and his pirates to blame for that? 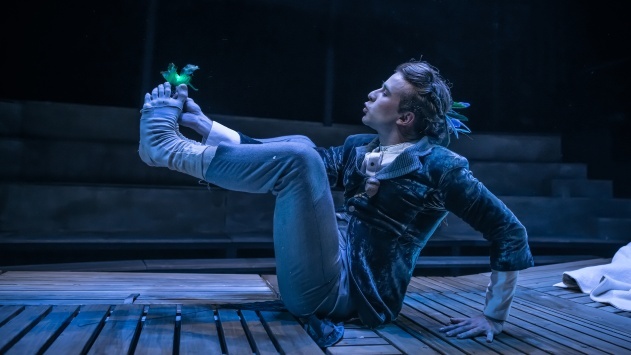 Peter Pan or the Boy Who Wouldn’t Grow Up, was a play written more than hundred years ago by Scottish writer and playwright J. M. Barrie and later on, after its enormous success, expanded into a novel and entitled as Peter and Wendy. But as the world grew more and more infantile, Wendy gradually disappeared from the book’s title. But Peter remained … with an impression that the story about growing up, bravery and the power of imagination was his story. But it is not. It is Wendy’s story, your story, my story, their story and a little bit our story as well. The interactive performance, inspired by the NO Theatre, in which three actresses and four actors play more than twenty roles, unveils this fairytale world through some minimalist sets and costumes from the one side and the functionally rich solutions from the other that fully come to life only by means of the carefully designed lighting and the fact – if we allow ourselves to remain a bit mysterious – that we are all sitting in the same boat. Yulia Roschina is a promising young director, whose directorial oeuvre already ranges from drama and puppet theatre to operas and librettos. Her projects are marked by a strong visual and refined aesthetics, accurately revealing the entire spectrum of human spirituality. Cast: Saša Pavlin Stosić a. g., Nik Škrlec a. g., Alenka Tetičkovič, Jernej Kuntner, Jan Bučar, Nataša Keser a. g./Ajda Toman, Voranc Boh a.g.
Set, Props and Costumes Production: Sandra Birjukov, Marjetka Valjavec, Zoran Srdić, Zala Kalan, Vladson, Olga Milič, Teresa Ondrusek, Lilijana Ban, Urša de Reya, Uroš Mehle s.p.